Summer is winding down, and hopefully you’ve enjoyed making memories with loved ones… as evidenced by your phone overflowing with pictures, right? Are most of your pictures from a vacation or outing? We tend to capture the moments on camera when we’re out intentionally spending time together, which is as it should be. 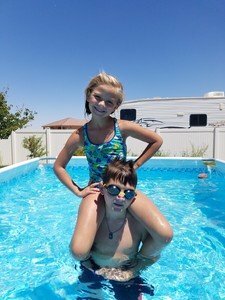 If you need ideas for sorting through all those photos to document family travel, head to this post. But what about all that time you spent at home with your kids or grandkids? What about the everyday summer routine? It’s worth capturing, too. That might take a little more planning and effort than the spontaneous captures in the great outdoors or at theme parks. It’s worth it, though. In our family, summer is definitely a different pace. Most mornings, I swim with my kids in our pool. It’s an everyday occurrence, at least for the last four years of summer. It may be ordinary and usual, but it defines how I spend time with my children. It represents my best efforts at intentional motherhood, because I play more actively with my children in the pool than anywhere else. And I love actually playing with them. So I knew those everyday mornings could not go undocumented. Someday, I want to look back at pictures and remember the many hours I spent with my two children on summer mornings playing in the water. The three of us playing wild and making up silly games…. So many games of “sea monster” where I have to chase and attack and wrestle them above and below water (this was much less dangerous when big brother was 7 than now that he’s 11 and getting close to my size!). “Monkey in the middle” with a small football. Back and forth, over and over. This is another one that has become more difficult as athletic big brother has grown; these days, little sister and I can’t even remotely compete. When she gets to choose, it’s usually “the dolphin game,” a creation of their joint imaginations that has evolved over the years and includes a distinct personality for each of them as dolphins. Big brother is an amazing inventor-warrior. Little sister is a stellar baker of sweet and savory seafood-based dishes. I get to be the Mommy dolphin who does, well, “Mom stuff.” We are periodically attacked by vicious creatures and have to work together as a family to defend ourselves. Big brother makes awesome space-age weapons for us to use, little sister keeps us fed with culinary delights dolphin-style, and I try to help fight, though my fake-machine-gun noises are still very inadequate. That’s what an everyday summer day looks like at my house. And I want to remember it. Because after all, most of life is made up of everydays. 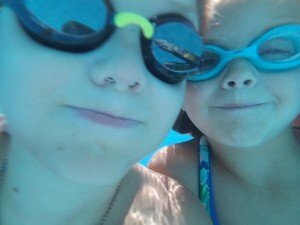 So I made an effort to take pictures of our silly swimming. I even put it on my to do list! 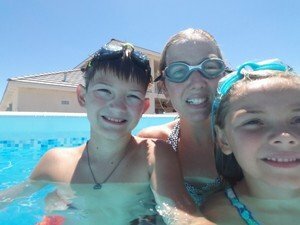 Now, I’m painfully aware that I’m not nearly as cute as my kids are in goggles and swim gear, but I decided I don’t care. I am out there playing with my kids, and I want them to remember that. I wasn’t just outside the pool taking pictures of them, I was right there in the thick of the splashing craziness. 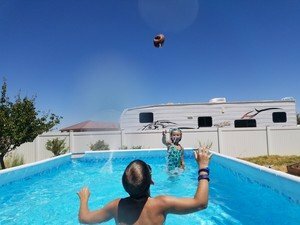 I took pictures and I wrote about our playtime at home in the pool. And I’ll always be glad I did. 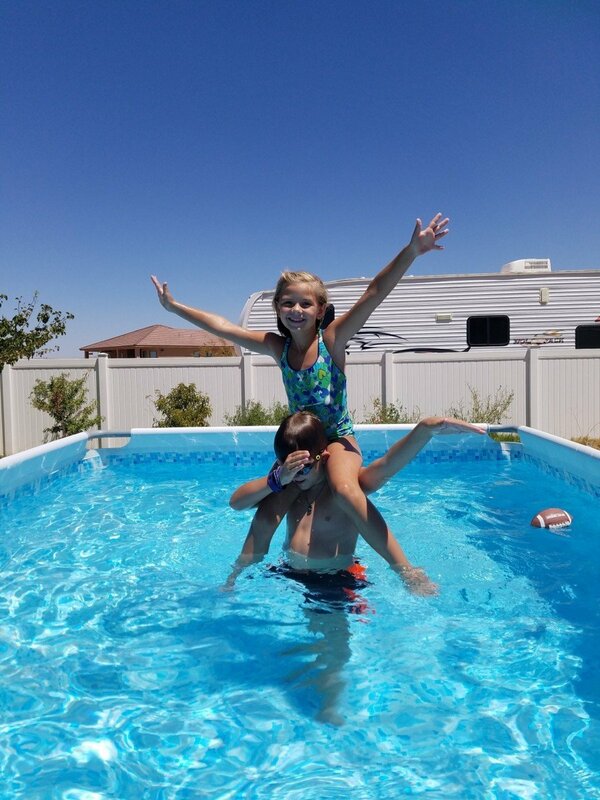 As you document your summer adventures, don’t forget to include those moments at home, those everyday regular activities that make up the bulk of your family time– and and the bulk of your memories. Take pictures and journal about those moments. So when the moments are gone, the memories won’t be. What tips do you have for documenting the everyday? I’d love your ideas. If this post was helpful, please share it on Facebook! You make memories, we make them last.